For almost four years now my Simutrans game experience has been limited by one only savegame. It started in April, 2012, in our terms, or in January, 1945, in game terms. Time settings were tweaked heavily - the game year passes for about a week of rather heavy evening playing, so now it's only July, 1975. The goal of the game was not in any term to make money - public service is heavily used, both for city and way building. My aim was to design a cozy yet giant metropolis and suburbs and vast, smooth and reality-like transportation network. Even now many distant regions of the map are yet undeveloped, mainly due to heavy focusing on central city (Doko). I use Simutrans-Experimental 11.10 with some rather old Pak128 with many addons. One of rather interesting features of this savegame is maybe that I was using my own name-generating program both for citylist and for street names (with some manually added loanwords, of course). It made some rather awkward, but, without question, original toponyms. I never touched goods transportation (well, I have one experimental line somewhere, but it's of no use), focusing solely on passanger network. There are also some problems, of course. 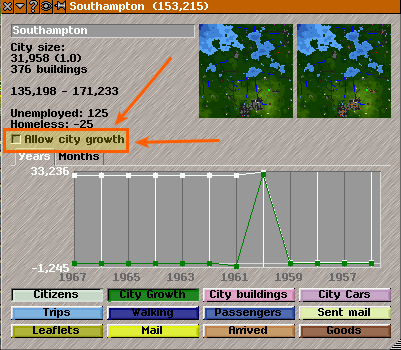 Firstly, due to time tweaking (or, maybe, something else) cities are growing much too fast. So, further from central regions, villages very often consist of densely put skyscrapers, which looks really ugly. The work on rebuilding them is conducted, but very slowly, due to magnitude of the task. And the growth for already rebuilt cities is forbidden. The second one is that I don't know how to share my savegame, due to messy and customized pak, which holds 666 MB! If someone has any suggestions on it, please share with me - I will gladly share the savegame! The transportation network is heavily inspired by one I had the most acquaintance with, i.e. St. Petersburg (or, more precisely, Leningrad - without the terrible shrinkage of 90's-00's), with heavy focus on trams, which Leningrad was once proud of. Suburb trains, metro, trolleybuses, buses, ships and airports are also in the game. Ah, a player after my own heart — I never play for profit. Although I have never ever had the patience to grow a map that large or anything like it! Nice!